In July, 2007, Taiwan government promulgated the "Act for the Development of Biotech and New Pharmaceuticals Industry", providing more attractive tax incentives to companies wishing to engage in biotech and new pharmaceuticals R&D. In Nov. 2016, Taiwan adopted the "Biomedical Industry Innovation Promotion Program". The program focuses on biopharmaceuticals, medical devices, and health and well-being as well as three key developmental efforts: "Development of Niche Precision Medicine," "Development of International Grade Medical Treatment," and "Promotion of Health and Well-being." The industry's targets for 2025 are a production value of more than US$30 billion, development and international marketing of 20 new drugs, and introduction to the international market of 80 new medical devices, and fostering of at least 10 flagship health-service brands. 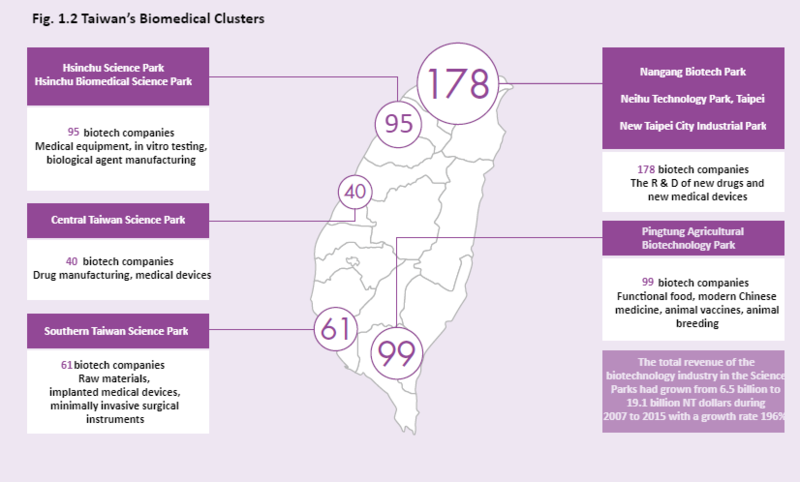 The effort to achieve these targets will stimulate breakthrough growth in the production value of Taiwan's drug, medical device, and health & welfare industries, boosting annual growth from 6% now to 9% in 2025. (1) A standard of medical-care technology that is third in the world and first in Asia. (2) Global leadership in the treatment of liver and lung cancer. (3) Comprehensive international-class value chain and outstanding medical-care system (including 19 medical centers and 124 clinical hospitals). (4) The Taiwan Clinical Trial Consortium (TCTC) attracts multiple-center cooperation. (5) Drug review regulations in line with international standards, and pharmaceutical processes developed in accordance with internationally accepted PIC/S or GMP specifications. (6) Graduation of more than 5,000 students in biotech-related fields each year, providing talent for technology development, market expansion, and industrial innovation. (7) Government use of the National Development Fund for direct or indirect investment in the biotech industry. Taiwan's health insurance system and health insurance coverage are world class. Service is not only reasonably priced, but large amounts of data are also collected to inform further drug development as well as for personal medical care and preventive medicine. The Government is developing and amending relevant laws and regulations, including: the "Fundamental Science and Technology Act," "Company Act," and "Pharmaceutical Affairs Act," in order to complete the legal environment for the biomedical industry. An amendment to the "Act for the Development of Biotech and New Pharmaceuticals Industry," completed in January 2017, relaxes the definition of high-risk medical materials and adds to the list of emerging biomedical products so as to expand the scope of incentives for investment in the biomedicine industry. (1) Nankang Biotechnology Research Park: Integrating a wealth of R&D resources, the park is developing an innovative R&D biopharmaceutical industry. (3) Central Taiwan Science Park: This park incorporates the resources of Central Taiwan's precision machinery industry to support the development of the precision biomedical device industry. (4) Southern Taiwan Science Park: This park utilizes the metal processing know-how of the Kaohsiung area to support the development of high-value dental and orthopedic metal processing and related medical device industries. 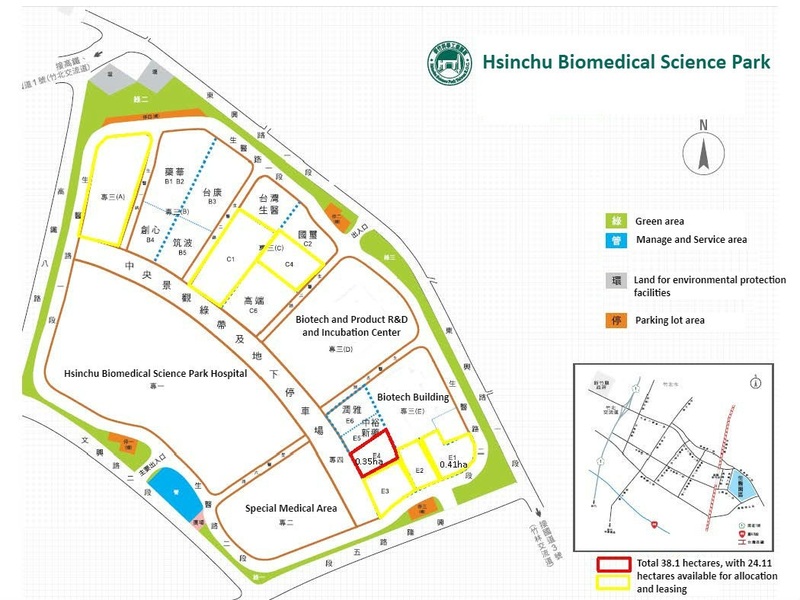 (5) Manufacturing and test sites: Flexible and customized sites are available for occupation, including those in the National Biotechnology Research Park, Building 2 of the Hsinchu Biomedical Science Park, the construction site for the Zhubei branch of National Taiwan University Hospital, and Kaohsiung Luzhu Biomedical Park. Taiwan's 2016 biotech and health and well-being sector business volume reached US$15 billion, growing at an annual average rate of 5.8%, significantly faster than the global rate of 4% or Japan's rate of 2.1%. With the growth Asia's elderly population and the rise of emerging economies in mainland China and Southeast Asia, the demand for basic medical care, home care, health improvement, and disease medication in the Asia-Pacific market has increased significantly. Foreign investors can make use of Taiwan's geographical advantage, talent, and technology parks, as well as government support measures such as tax incentives and R&D subsidies as specified in the "Act for the Development of Biotech and New Pharmaceuticals Industry" with the intention of positioning Taiwan as a production base or regional headquarters that accelerate entrance into the Asia-Pacific market. 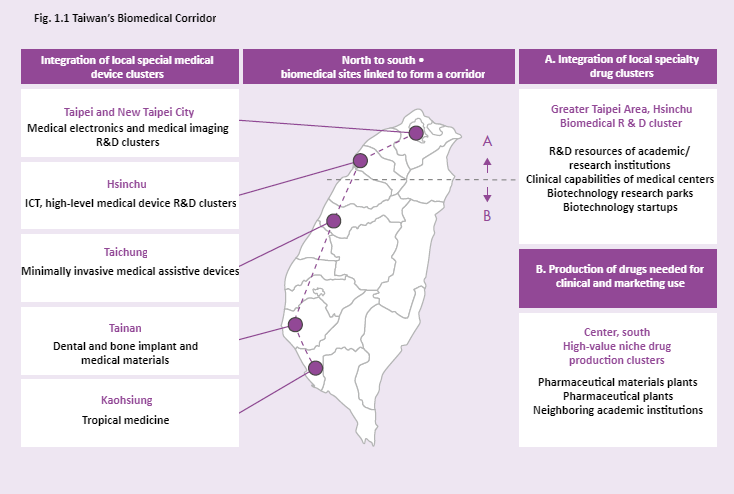 The supply chain for the development of Type II medical devices (including contact lenses and blood glucose meters) in Taiwan is mature and is actively seeking integration and cooperation in the development of high-level and high-value medical equipment. Foreign companies that invest in Taiwan will be able to accelerate the development and marketing of products with high quality and fair prices. Backed by Taiwan's marketing experience, they will be able to sell their products in mainland China and other emerging markets. (1) Taiwan will become an aging society in 2018 (with the elderly accounting for more than 14% of the total population). The public-sector Long-Term Care 2.0 budget for 2017 is approximately US$600 million, and will be raised year by year. Taiwan has flexible test beds and regulations which, together with the innovate service models of domestic and foreign companies, promote the creation new business opportunities in the senior citizens' market. (2) Taiwan's high-quality of medical-care systems and solid ICT foundation are conducive to the establishment of infrastructure for supporting environmental systems, such as monitoring service platforms, information system services, and an integrated platform for intelligent health services. (2) A biotech and new pharmaceutical company may, for a period of five years from the time it is subject to the corporate income tax, enjoy a reduction in corporate income tax payable of up to thirty-five percent (35%) of total funds invested in research and development ("R&D") and personnel training each year; if the R&D or personnel training expenditure for a particular year exceeds the average expenditure of the previous two years, fifty percent (50%) of the amount in excess of the average may be credited against the amount of corporate income tax payable. (3) A profit-seeking enterprise that (i) subscribes for the stock issued by a biotech and new pharmaceuticals company at the time of the latter's establishment or subsequent expansion; and (ii) remains a registered shareholder of the company for a period of three years or more, may, for a period of five years from the time it is subject to the corporate income tax, enjoy a reduction in its corporate income tax payable of up to twenty percent (20%) of the total amount of the price paid for the subscription of shares in such biotech and new pharmaceuticals company..
(4) New shares issued by a biotech and new pharmaceuticals company to top executives and technology investors (in return for their knowledge and technology) shall be excluded from the amount of their consolidated income or corporate income of the current year for taxation purposes. (5) Imported machinery that is not yet manufactured domestically may enjoy tariff-free treatment. (6) Royalty payments to foreign companies for imported new production technologies or products that use patents, copyrights, or other special rights owned by foreign companies are, with the approval of the Ministry of Economic Affairs, exempt from the business income tax. (4) Industrial Upgrading and Innovation Program: For companies having R&D teams in Taiwan, subsidies are available for 40% to 50% of project funding for projects that conform to government programs and up to 40% of funding for projects generated by the applicants themselves. The US company Pfizer continuously expands its investment in Taiwan for drug manufacturing and R&D. The SHL Group of Sweden is strengthening the automated functions of its Taiwan production line for medical devices. The Novartis Venture Fund of Switzerland has sought out biomedical investment targets in Taiwan on several occasions.